So I'm going to a conference next week in San Antonio. I've never been, so I'm wondering if there are any good gaming stores worth hitting downtown? Or perhaps used book stores? I'd be looking for miniatures, out-of-print gaming stuff, and used fantasy fiction. As you know, I'm teaching a course on the history and culture of RPGs this spring. I plan on posting the list of readings here shortly, so that you can follow at home if you like. In addition to the required course readings, I plan on including a list of recommended readings, movies, and fan-films. If you had to introduce a bunch of early 20s newbs to D&D, what sort of background reading/viewing would you recommend to them? I'll start with a couple of my own thoughts. I'm trying to pull from the breadth of D&Ds history. Your opinions/thoughts on the question above? 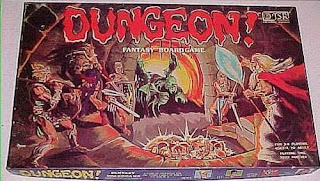 Last week I busted out my original classic Dungeon! Boardgame. As I had a look-through, I noticed that I was down a few cards, mostly monsters. Does anyone know if there is an itemized list somewhere on the interwebs of the monsters and treasures by level for this game? Alternatively, if you have a copy of this game and feel confident you have all the cards for all/some of the various levels can you email me or post here? In our Northern Reaches campaign we have been playing double rolled damage on a critical hit. That was an extension of how I played AD&D and AD&D 2nd Ed. back in the day. If you rolled snake-eyes for your dmg that was just too bad. I'm curious, how do you play critical hits/misses in your old school game? The 14th campaign session in our LL (D&D .75) game wrapped up the other night. Scratch the halfling thief opened a chest without checking for traps...yeah, you know how that ended, and Vith died the session before when he was eaten by a mimic. Go here for The Tale of Woe. I submitted an entry "The Bastion of the Boglings" to the one page dungeon contest this year (my first). The first one I played was "The Ancient Academy" by Stuart Robertson last summer. It was straightforward and fun. It will be interesting to look through the other entries. I'm already scanning the names looking for possibilities for my own campaign. Too bad they aren't grouped by level. You an find the entries here.